View More In Chondroitin & Glucosamine. N-Acetyl Glucosamine is an aminosaccharide; synthesized from glucose and the amino acid L-glutamine; that has been stabilized by complexing it to an acetyl group. N-Acetyl Glucosamine is the body's precursor to hyaluronic acid; which is part of the synovial fluid that lubricates joints. 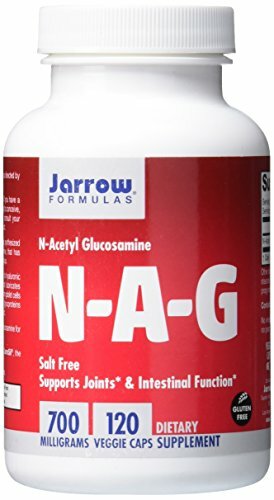 * N-A-G combines with mucin secreted from goblet cells to form the glycocalyx; a protective layer of glycoproteins and polysaccharides that lines the digestive tract. N-Acetyl Glucosamine is the versatile form of glucosamine for joint and intestinal tissue. * Keep out of the reach of children. If you have any questions about this product by Jarrow, contact us by completing and submitting the form below. If you are looking for a specif part number, please include it with your message.